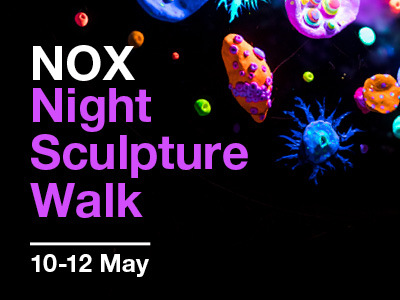 NOX, Latin for night, is a night sculpture walk around the Randwick Environment Park. Experience the natural environment like never before as artists from UNSW Art & Design transform the park and wetland into an illuminated outdoor art gallery. 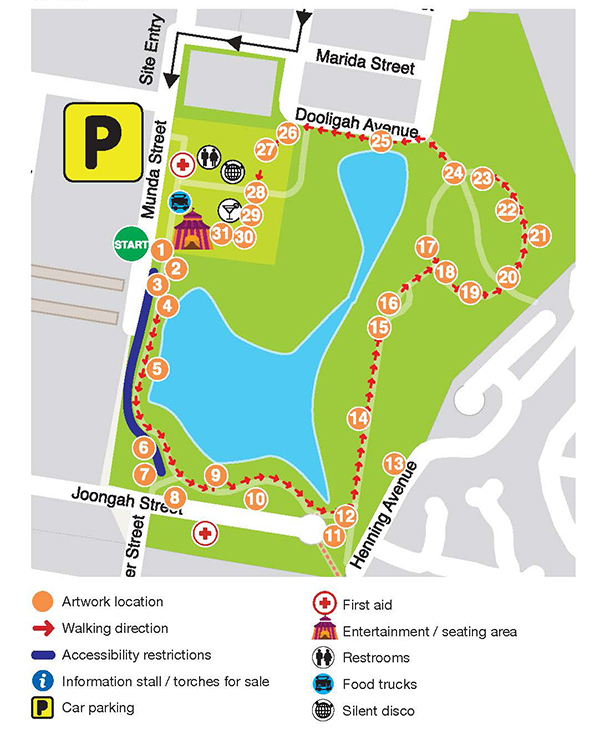 For three nights only artworks will be installed around the park to form a leisurely 1.5km loop walk, starting and ending at the Randwick Community Centre. All artworks on the journey will be powered and lit by renewable energy sources. The after dark art continues with our new addition – NOX Night Cinema. Students from UNSW School of the Arts and Media will be screening short films and animations which will be on rotation in the auditorium, based around the themes of ecology and sustainability. After the walk, grab a bean bag and chill out under the starry skies with a drink or gelato from event supporters Archie Rose and Gelato Messina, as well as our valued local food trucks. Food trucks and bar will be trading from 5pm to 9pm. The Sculpture Walk is 6pm to 8pm. Kids activities and live music will keep you there long after you’ve done the walk. Take a look at the highlights from the 2017 Nox Night Sculpture Walk! 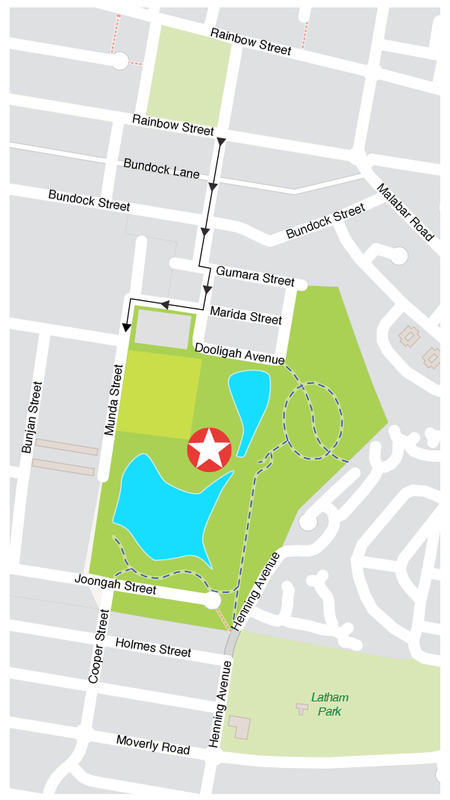 The NOX walk starts at the Randwick Community Centre (27 Munda St, Randwick). If you enter the sculpture walk via surrounding streets, please walk in an anti-clockwise direction. This is a 1.5km loop walk. The 2019 Program will be available soon, here is the link to the 2017 Program PDF, 17518.6 KB there will be copies available at the start of the walk. NOX is best accessed via Munda Street, Randwick. The NOX sculpture walk starts from the Randwick Community Centre, where you can pick up a program and information before commencing the walk. If you are walking to NOX, you can enter the exhibition from other access points (eg. Dooligah Avenue, Joongah Street or Henning Avenue). We recommend that you walk in an anti-clockwise direction to prevent congestion on the art walk. This is a loop walk. Car parking is available at the Randwick Community Centre, located at 27 Munda Street, Randwick.There will be reserved car parking for visitors with limited accessibility and mobility. Please see our Welcome Staff who will direct you to a car space. On both bus services, we recommend that you alight at the Bundock Street (opposite Hendy Street) bus stop. From there, it is a short 5 minute walk to the event via Hendy Street. There will be illuminated arrow signs to point you in the right direction. In order to make your NOX experience as effortless and enjoyable as possible, here you'll find answers to some frequently asked questions about the night sculpture walk. Is NOX a ticketed event? You do not need a ticket to attend NOX - all you need to do is turn up! The exhibition times are 6-8pm every night during the NOX event. During this time, you will see artworks, installations, video works and live performances. The bar and food trucks will operate from 5pm to 9pm. We recommend wearing flat sturdy shoes and something warm. Is the event wheelchair and pram accessible? The NOX Night Sculpture Walk is an easy 1.5km loop walk with no stairs. The majority of the walk is relatively flat and situated on wide paved footpaths, enabling easy access for wheelchair and pram users. However, a short part of the walk (approximately 50m) is unpaved, narrow and located alongside bushland. It is possible for a small pram/wheelchair to navigate this section of the walk which contains 2 of the 31 artworks. Accessibility on this section may prevent larger wheelchairs from continuing on with the sculpture walk. We recommend returning to the Randwick Community Centre via the paved sections of the walk to enjoy the range of entertainment being provided. Event staff will be on site every night to assist with accessibility and safety. Will there be accessible parking? Car parking close to the event entry will be available for visitors with limited mobility and/or using a wheelchair. A valid mobility parking permit must be displayed. Dogs are welcome at the event but must be on a lead at all times. Additionally, dogs must not be within 10m of food preparation areas. There will be an ATM available at NOX.